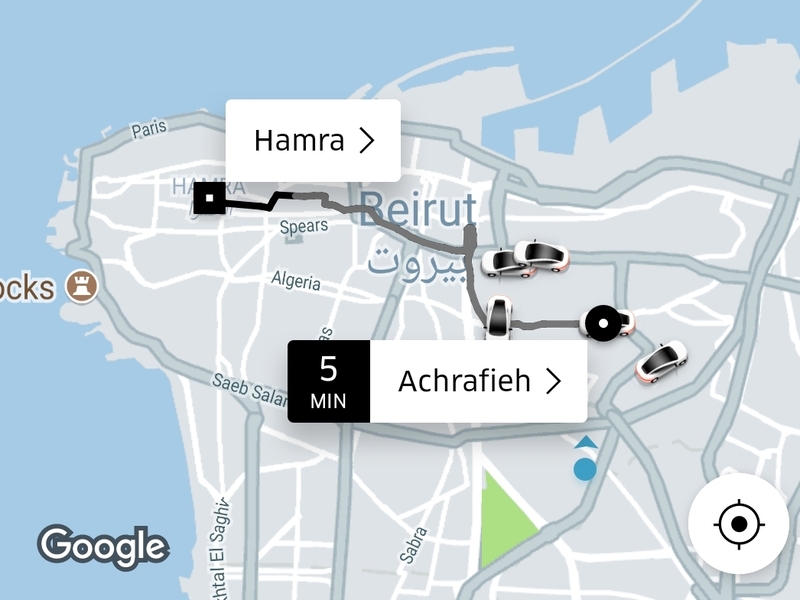 In Lebanon, Uber still makes it possible for drivers and riders to find out each other’s phone numbers, which has, in several cases, allowed drivers to harass or threaten riders for reporting them or giving them a bad rating. A screenshot from the Uber application. April 20, 2018. In March, Ameen Rhayem, an Uber user who lives in Lebanon, received a perplexing text message from an Uber driver he had just reported. “Thank you for reporting,” the message said. Two hours later, he received a second message, demanding, “What did I do to you?” Rhayem then blocked the number and wrote about his experience on Facebook, expressing alarm that the message had arrived on his private number and wondering whether the driver might also harass him in person. “After I posted on Facebook and tweeted about it, Uber called me and said that they are on it,” said Rhayem. This after-ride exchange and others like it that SMEX has learned of are made possible by the fact that in Lebanon, Uber does not mask phone numbers in calls between drivers and riders who use the in-app calling feature. When using this feature, individuals’ phone numbers will be exposed and will appear in both the driver’s and the rider’s call logs, jeopardizing the privacy of their personally identifiable data. In other countries where Uber operates, such as the United States, riders and drivers who use the ride-hailing application to make a call will see an anonymized phone number. In many markets, these masked numbers are provided by the third-party company Twilio, a US-based cloud communication platform. But Twilio does not operate in all countries where Uber has a presence. While Uber has said that it uses other third-party providers in countries where Twilio does not operate, this is not the case in Lebanon. After researching posts from other users and asking people to share relevant past experiences, SMEX learned of four similar cases where Uber users in Lebanon were directly contacted by a driver whom they had either reported or given a bad rating. In one of those cases, a user, who asked to remain anonymous, received a text message from a recently fired Uber driver with whom she had ridden a week before. In his message, she said, he accused her of reporting him, demanding to know “why have you done this to me?” and claiming, “you have ruined my life and got me fired.” She says she did not report him, but believes that he thinks she did, perhaps because she was the last one to ride with him before he got fired. The ride-hailing company encourages riders and drivers to rate their trips as a means of holding both parties accountable for their behavior. According to Uber’s website, the company uses a system by which drivers must maintain an average minimum rating to keep using the app. This minimum differs from city to city for cultural reasons, Uber policies state. When drivers’ ratings get close to the minimum rating allowed, Uber sends them a warning and gives them the chance to improve their rating before suspending their account. If a driver or a rider is reported, the case is investigated and, depending on the severity of the threat, their account might be temporarily suspended or permanently blocked. Such suspensions can lead to the driver’s dismissal. An Uber spokesperson explained that the application does not notify drivers when they are reported or rated. Drivers can, however, see the change in their overall rating and the number of people who have rated them and may assume the most recent riders were responsible. Do not call the Uber driver using the in-app calling feature; if you must get in touch, use the in-app messaging feature instead. Never give a driver the exact pickup or destination address especially if it is a private residence or workplace or a frequent destination. Remove the in-app calling feature until it is able to introduce anonymized phone numbers. Push for the activation of masked phone numbers, or develop other anonymized in-app communication methods. If masking through a third-party service is not possible, Uber should establish its own calling centers that can re-route calls. According to the chief press officer of Careem, Uber’s main regional competitor, calls between drivers and riders are rerouted through a local Careem call center, which only shows the driver a Careem landline number. Remove the option for drivers and riders to contact each other through the application after the trip is over. Lost and found items and other issues can be reported through Uber’s customer support channels.